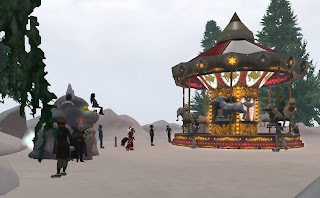 Once again Egnog the christmas Troll returns to Second Life to spread joy with the Kid Avatars. Unfortunitly he was kidnapped by the evil grand master who lives under Goony Island. 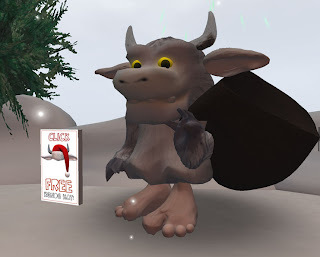 The Goonies bravely battled the lag and gelatinous cubes to rescue Egnog for all the Kids of Second Life. Egnog was greatful for his rescue but with tears in his eyes he explained that his christmas gifts had been stolen and there was only the big Christmas Carousel to give everyone. That is when Loki suggested that maybe if everyone made or gave something to put in Egnogs sack, then everyone in the Second Life Childrens Community would have a MEGA big present from everyone. GIVE TO YOUR COMMUNITY! COME TO GOONY ISLAND AND DROP A PRESENT IN EGNOGS SACK! (press CTRL key while dragging your gift onto the empty sack, it will outline in red, then let go. ON CHRISTMAS DAY THE CONTENTS OF THE SACK WILL BE AVAILABLE TO EVERYONE! If you are looking for a place where virtual kids are actually welcomed then check out Meta 7!